We all know L-shaped desks are gaining more and more popularity each day. For those who want to set up a home office, it is an exceptional choice for the best use of your office corner. Also, with the beautiful designs, L-Shaped desk will lighten up your place and mood. With the increasing popularity and numerous user demands, furniture manufacturers make different kinds of L-shaped desks nowadays. As every desk does not fulfil everyone’s unique demands, people from different professions or people working in different environments will require different types of facilitation from their desk. For example; some people are tall, so they will naturally require a desk which has adequate space for them to stretch their legs. Or some people might not have enough space in their room, so they need a comparatively smaller desk. Furthermore, not everyone has the same type of budget or doesn’t share the same kind of fashion sense or style. Considering all that we have made a list of Best 13 L-Shaped Desks for your home office. Our purpose is to help you choose the right one for your profession and environment. Let’s check the list quickly. The Sauder Harbor View L-shaped desk is both stylish and well functional at the same time.It is a very simple designed desk with a type of color that goes well in any setting; a milled cherry and salt-oak finish that is very pleasing to eyes. The desk has enough space for you to spread out your work. You can put your PC, notebook, desk clock, and other office essentials in there with ease.What is more, it has three drawers and two of them with full extension slides. There is a large storage area behind a door which you can use for your CPU tower. It has an adjustable shelf as well. And a metal run sliding tray for your keyboard and mouse. This Walker Edison Soreno desk will help you in using your space efficiently. This L-shaped desk is designed for maximum workspace. The desk has two 21-inch deep rectangular desktops and a quarter-circle shaped desktop which gives you a lot of working space. Walker integrated beveled tempered safety glass in the desktop.It has steel framed legs which are black powder coated, making it a very sturdy and stylish looking desk.The desk has a CPU stand attached to it. A keyboard tray also comes with it which you can mount on either side of the desk. More so, you can separate it into two independent desks. For your limited space home office, Ameriwood Home Dakota desk should be a perfect fit. It is built to make the best use of your corner places which results in utilizing your office space. The large portion can be used for your computer monitor, printer or other documents. It has many shelves as well where you can keep your books, magazines or other office essentials.This desk also provides you with two grommet holes to keep your cables nicely arranged. Its beautiful espresso finish gives your office an elegant appearance. Particleboard and MDF used in the desk to make it strong and stable. This desk is a combination of glass and metal. A blend we all love to see on a desk, don’t we? Its beautiful glass is sure to improve the look of your office. While its metal will give you durability, it has a raised display shelf which you can use for your monitor or printer. There is an attached slide-out keyboard tray for your keyboard and mouse.Its large desktop is made of tempered glass. The desktop has enough space for an additional laptop or two monitors, files, and other office supplies. The desktop has three pieces of glasses; two rectangular and a corner piece. The metal frame is strengthened on welding joints by plates. And the frame is black powder coat finished which makes it contrast beautifully with the glass. If you want spacious, neat, and serene feel in your office, Monarch Specialties White L-shaped desk is for you! It is a very well designed stylish piece of furniture. It has clean-cut lines and thick panel construction which is beautifully complemented by a white finish. On one part of the desk, there are two medium drawers and a lateral file drawer. You can use those for your files, papers or other office supplies. On another part the desk, you will have open shelves. So there is no shortage of storage.Its desktop is spacious enough for you to multitask. Like; you can use it for writing and also for your computer. The desk is made of wood and veneer which makes it strong and durable at the same time. Bestar Hampton Wood Desk is a beautiful piece of furniture. It will provide your home office with astounding functionality and design, helping you make the most out of your office corner and limited workspace. The furniture is Tuscany brown and black finished. And the black is glossy which makes it even more gorgeous.The desk is quite heavily built, and it is durable. There is a top shelf on the desk for your monitor or should I say, monitors? Because it is spacious enough to hold two monitors, not side by side but more like in a V shape position. The desktop seems big enough for you to multitask. Like you can keep your stuff there, use it for writing and also work on your computer. The desk has a slide-out keyboard shelf attached to it as well. There is also a behind door space on one side of the desk. This Sauder Harbor View will maximize your office space. Its spacious tabletop surface is of melamine. So as you can guess, it is heat, stain, and scratch-resistant. The desktop seems large enough. You can set your monitor there, desk lamp, other official stuff, and yet attend to your paperwork. The table has a slide-out keyboard shelf for your mouse and keyboard. To keep your place organized, this desk provides you with two easy gliding drawers and a behind the door storage area for your tower CPU.A grommet hole comes also integrated into the desk to keep your cords organized. Sauder Harbor desk is finished in the antiqued paint with American cherry accents, giving it a very stylish look. Sauder 417714 Palladia is a highly stylish piece of furniture. The wind oak finish is sure to increase the beauty of your environment. It has flip down slide-out shelf for your laptop or keyboard. Its file drawer can hold letter or legal size hanging files when fully extended. Moreover, this desk hoards three more drawers where you can put your other office essentials.The desktop is large enough so you can easily multitask. Grommet holes are made in the desktop to keep your cords in an ordered manner. There is a behind the door storage area which you can use for your vertical CPU tower, and also, an adjustable shelf in that same storage area. Bestar Connexion L-shaped workstation is one sturdy desk many of us look for. Its sturdy metal framework marks it a stable desk and makes sure that you can do your work without shaking. The desk is manufactured with laminating wood. And, this laminate desktop holds up well under regular use, and it is utterly straightforward to maintain.Bestar’s desk has a ball-bearing slide-out keyboard shelf, and it can be used under the executive desk, credenza, return table or bridge.It also has pedestal drawers that are supposed to go attached to the credenza, or to the executive desk. Two of which are utility drawers that you can use for keeping all sorts of office essentials. And the other one is file drawer with letter or legal filing system. If you are looking for a desk that is simple yet durable and easy to maintain, Office Star Prado Complete L-shaped desk could be it! This desk can help you make the best use of your home office corner. You can attach the return section to either the left or right side of the desk as you wish. Its desktop is thick laminate which makes it sturdy and yet easy to maintain. It is also large enough for multitasking.You can set up your whole computer there like your monitor, CPU, speakers, keyboard, mouse, printer, and yet have enough room to do your paperwork. The desktop has two metal wire management grommets. Office Star table’s legs are of metal which makes it quite a sturdy piece of furniture. Super Deal L-Shape Corner Computer Desk is a very modern style and simple piece of furniture. This desk consists of one rectangular desktop, one diagonal cut desktop, and its steel metal legs. They all join together in l-shape to form one abundant surface space. This modern designed desk will save a lot of your office space. And its sleek and open bottom will provide you with plenty of leg room. The table also has a slide-out keyboard tray that will save more of your desktop space.A universal autonomous CPU stand is also included. The whole desk is sleek, high-glossy finished which gives it a very beautiful, impressive look. This beautiful piece of furniture is hand applied espresso finished. It can help your surrounding look better than ever before. The desk has two utility drawers with removable dividers and another file drawer fitting for letter or legal sized documents.It also has one convertible drawer which you can use for keyboard or laptop use. Behind the cabinet door, there is a pull-out tray for a printer. Its drawers are really well constructed with full suspension ball bearing glides and accurate channel joints. The desktop is quite large, so you don’t have to worry about multitasking. You can easily set up your computer there and also attend to your paperwork. This is one stylish modern desk that could be ideal for your home office. This table provides you with plenty of desktop surface. You can set your computer there, and also do your writing, studying, gaming, and other office activities with ease. It fits perfectly in the corner or up against any wall and will help you in utilizing your limited office space.FCL desk is made from quality MDF which makes it a sturdy and durable piece. A slide-out keyboard tray is also attached to the desk saving more of desktop space. The desk also has a CPU stand affixed to it. So here you have our list of 13 best home office L-shaped desks. As you can see, different desks have different perks and specialties. Consequently, before you pick yours, I would suggest you consider some basic stuff. 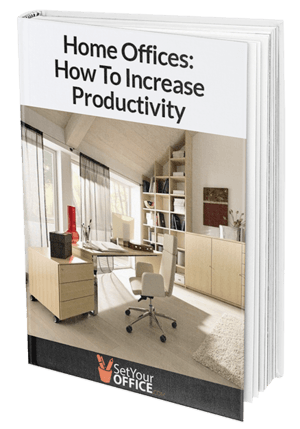 Like what kind of work you are going to use your desk for, and which desk can fulfill that purpose – that should be the priority. Then you got to consider which size of the desk you can afford to set up in your place. And, which one suits your environment the most. But if I were to recommend one, (remember that’s entirely based on my personal preference and requirement) I would go for Ameriwood Home Dakota L-shaped desk with bookshelves (espresso). It is a perfect fit for my work and environment. Besides, its simple design and color synch ideally with my taste. Hope this post helped you to choose the right desk for your home office. If you’ve found the post useful, feel free to share it on Facebook, Twitter, or Google+.